Did you know that koala bears smell like cough drops? It's from the eucalyptus leaves they eat. That's what the zoo lady told us on the tour. And they have pouches. (They are marsupials... which doesn't mean they are from Mars and eat soup, I found out.) And they are sleepy heads. My favorite part of a koala bear is their funny nose. This cute baby koala bear says, "Just remember, YOU ARE koalafied. And by the way, could you make me a eucalyptus salad?" Then he takes a nap. Good night. While snoozing, he dreams he has eucalyptus leaf wings, and he's flying! He learns he can eat his leafy wings , and then they grow back. And.. they grow back in different flavors! That's why he's smiling in his sleep. That's probably why they sleep so much, they are having delicious dreams. Send this cute baby koala bear puzzle to a friend as a jiggy free ecard greeting. 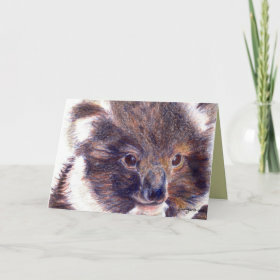 Here is the baby koala picture enlarged on a cute thank you card. Inside reads: "Thanks for koala your help". Here are cute baby koala bears fun free internet jigsaw puzzles game 015 to play. The drawings of a koala bear below were done with Prismacolor colored pencils. They are perfect for showing their fluffy fur texture. You can see how small baby koala bears are fitting in the keepers gloved hand. So cute. Adorable creatures! Crikey Cute!